See Gillespie County Fair & Festival Assn listing below. Gillespie County Historical Commission: See full details in Directory below. Historic Schools In Gillespie County: See full details in Directory below. More history: at Portal city profiles in list shown above, including Fredericksburg. GILLESPIE COUNTY, APPRAISAL DISTRICT (GCAD): 830-997-9807; 101 W Main St, #11, Fredericksburg, TX 78624. www.gillespiecad.org. Responsible for property value appraisal and tax collection. COUNTY ATTORNEY: 830-990-0675; Gillespie County Annex 1, Unit L41, 125 W Main St, Fredericksburg, TX 78624. Represents the State of Texas in all criminal cases under examination or prosecution in Gillespie County. Also attempts to collect restitution for merchants and persons who have received hot checks. Open: Mon-Fri, 8a-5p, except noon lunch hour. GILLESPIE COUNTY, CONSTABLE - PRECINCT 1: 830-997-7585; 1601 E Main St, Fredericksburg, TX 78624. Serves as bailiffs for JP courts; collects money owed on judgments; serves civil process; enforce traffic laws; assists other law agencies at traffic accidents. GILLESPIE COUNTY, CLERK: 830-997-6515; 101 W Main St, Mail Unit 13, Fredericksburg, TX 78624. Conducts elections; records public land records; serves as clerk for county criminal/civil/juvenile/probate courts; records births, deaths and marriages; and keeps records on registered marks and brands. GILLESPIE COUNTY, DISTRICT CLERK: 830-997-6517; 101 W Main St, Rm 204, Fredericksburg, TX 78624. Handles all criminal cases, divorces, parent/child relationship matters, civil cases (up to $10,000), passports, naturalization and citizenship records. GILLESPIE COUNTY, EXTENSION OFFICE: See AgriLife on Fredericksburg profile. GILLESPIE COUNTY, JUSTICE OF THE PEACE - PRECINCT 1: 830-997-6912; Gillespie County Annex 1, 125 W Main St, Fredericksburg, TX 78624. Handles civil disputes involving up to $10,000; and handle inquests, mental commitments; evictions; magistrate individuals who have been arrested, hear traffic cases, issue warrants, and grant emergency protective orders. GILLESPIE COUNTY, OFFICE OF EMERGENCY MANAGEMENT: Fredericksburg, TX 78624. See more below. GILLESPIE COUNTY, PIONEER MEMORIAL LIBRARY: 830-997-6513; 115 W Main St, Fredericksburg, TX 78624. www.pmlfb.com. Also known as Fredericksburg Memorial Library. Built in 1882 to replace the original 1855 courthouse, and was later superseded by the current 1939 courthouse designed by Edward Stein. The first floor houses the Pioneer Memorial Library; second floor functions as a community hall. Often called the McDermott Building because of the restorations funded by McDermott. National Register of Historic Places in 1971, and designated a Recorded Texas Historic Landmark in 1967. GILLESPIE COUNTY, SURVEYOR: Verifies and clarifies property boundaries under original land grants. 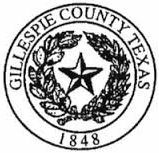 GILLESPIE COUNTY, TREASURER: 830-997-6521; 101 W Main St, Unit 5, Fredericksburg, TX 78624-3700. Invests funds, receives and accounts for all monies belong to the County; and disperses County money. Serves as the Human Resource Dept and Payroll Dept; Collects County hotel occupancy tax. GILLESPIE COUNTY, VETERAN'S SERVICE OFFICE: 830-997-3758; Gillespie County Annex 2, 102 E San Antonio St, Ste B-2; Fredericksburg, TX 78624. Assists with navigation of various veterans assistance programs. GILLESPIE COUNTY, COURT HOUSE ANNEX 1: 125 W Main St, Fredericksburg, TX 78624. Located next to Court House. Former US Post Office Building. Currently: Driver's License Dept; JP Offices; County Attorney; Community Service; Hot Check Dept. GILLESPIE COUNTY, LAW ENFORCEMENT CENTER (LEC): 1601 E Main St, Fredericksburg, TX 78624. Located on E side of town, houses City and County law enforcement offices, including County Sheriff. GILLESPIE COUNTY, LAW ENFORCEMENT BUILDING (LEB): 100 S Nimitz Pkwy, Fredericksburg, TX 78624. Located next to and S of the Court House. LOCATION NOTES: The "Courthouse Square" property includes: Courthouse, Pioneer Memorial Library, Law Enforcement Bldg (Jail), and Annex 1 (in former USPO bldg, includes offices for: Drivers License, JPs, County Attorney, Community Service). Annex 2 is located across the street from the Courthouse and has offices for Veterans' Affairs. MULTIPLE CITY OR COUNTY-WIDE INCIDENTS: Also see Sheriff's Dept above. 333 Earl Garrett, Kerrville, TX 78028. hccarc@ktc.com. A humanitarian organization led by volunteers and guided by its Congressional Charter and the fundamental principles of the International Red Cross Movement, that provides relief to victims of disasters and helps people prevent, prepare for and respond to emergencies. Serves Blanco, Gillespie, Mason, Menard, Kimble and Kerr counties. HILL COUNTRY COUNCIL OF ALCOHOL & DRUG ABUSE, INC: 830-367-4667; 102 Business Dr, Kerrville, TX 78028. www.hccada.com. The mission of this non-profit is to provide comprehensive substance abuse recovery and behavioral health services to help individuals and families achieve and maintain a healthy and productive lifestyle. This is accomplished through comprehensive treatment and prevention methods guided by a philosophy of mutual concern and responsibility. Also offers mental health services to include case management and therapy. Serves: Bandera, Gillespie, Kendall, Kerr and Medina Counties. TEXAS MASTER GARDENERS: www.txmg.org. A non-profit organization under the Texas A&M AgriLife Extension Program. Mission is to disseminate horticulture education on gardening, water conservation, soil maintenance, native & earthkind planting. Note: See chamber, tourism, economic development & non-profit listings in Fredericksburg city profile. Rates are shown per $100 valuation.